click to ask a Specialist Consultant. For nature lovers, the best time to visit Perth is undoubtedly during wildflower season, where the landscape erupts into magnificent colour. Travel to WA during September, October or November with this package to experience this remarkable natural phenomenon. There are more than 15,000 species of wildflowers throughout WA - many only found here - such as clusters of splendid rare orchids in the south, prolific inland carpets of everlastings as far as the eye can see to colourful roadside kangaroo paws. Book now to save - wildflower deals are selling-out fast. Feel the great expansive openness of the West Coast with its big blue skies and its ever developing but still youthful capital city of Perth. You will be transferred from the airport to your hotel. You can relax and use the rest of the day to explore your hotel and its facilities, perhaps take a stroll around the neighbourhood and central Perth. Meet and Greet Personalised Arrival Transfer, Overnight Accommodation. Lying in the Nambung National Park, the Pinnacles are a breathtaking wonder of nature. These amazing, natural limestone structures hold an exquisite air of mysticism and intrigue, especially as the sun's warm hue illuminates the magical stones. The gorgeous town of New Norcia is renowned for its wonderful Spanish architecture and unique history. Founded by Spanish Benedictine monks in 1847, New Norcia's quaint streets are full of heritage listed buildings, including the beguiling Monastery, where you can still join the monks for prayer. The Western Australian landscape explodes in a kaleidoscope of colour and beauty as thousands of magnificent wildflowers bloom in a spectacular seasonal show of nature at its most breathtaking. Today we combine the amazing natural wonder of the Pinnacles Desert with the unique living history of the 170 year old Spanish Benedictine enclave of New Norcia. See Guildford and the fertile Swan Valley en route to New Norcia for a special guided tour of Australia's only monastic town, including the monk's shop for some famous New Norcia nut cake and breads. Visit a Wildflower Farm, the lobster fishing village of Cervantes and enjoy a gentle stroll through the mystical limestone pillars of the Pinnacles Desert. Tour north through the historic and charming Guildford, onto the Swan Valley (Western Australia's first wine growing region) and stop at New Norcia for a private guided tour, including buildings not accessible to the public. See New Norcia Museum and Art Gallery (a piece of Spain comes alive, find extraordinary artefacts dating back to when New Norcia was an Aboriginal mission, historic wheatbelt farming techniques), New Norcia Abbey Church (home to one of only two large Moser organs, originally crafted in Germany) and St Gertrude's College (a grand gothic style building which was originally built as a girls boarding school and opened in 1908). Enjoy morning tea, then visit the Benedictine Community produce shop for the chance to purchase hand crafted goods including olive oil, fruit, wine, New Norcia nut cake and breads. Visit a wildflower farm for a talk and see how wildflowers are dried and exported worldwide. Stop to view wildflowers throughout the day whilst they are in season (including orange flowering Christmas tree, kangaroo paw, banksia, wattle and everlastings). Pass Emu Downs Wind Farm at Badgingarra (48 wind turbines, 68 metres high, gracefully producing clean electricity to power 50,000 homes) and see Ronsard Bay. Travel to the laid-back lobster fishing village of Cervantes with its pristine white sand beach, turquoise waters teeming with marine life. A delicious picnic style lunch is served before venturing in to the Nambung National Park, a landscape of coastal dunes, beautiful beaches and rich in flowering plants and home to western grey kangaroos. View the Pinnacles from the lookout or take a stroll through part of the Desert, containing thousands of limestone Pinnacles, some up to 5 meters high and see these remarkable and mystical geological features close up. Visit the Pinnacle Desert Discovery Centre to learn about these natural wonders. Head back to Perth with your camera full of remarkable images of today's great adventure. The beautiful city of Perth is fringed by the Indian Ocean and the Swan River. It has spectacular beaches, a friendly welcoming ambience and a laid back lifestyle dominated by its seemingly perpetual sunny climes. Chic and stylish, Perth effortlessly combines this beach-outdoor lifestyle with its modern, urban big-city feel. You'll marvel at the spectacular cityscapes from beautiful Kings Park, and enjoy the balmy waters of the Indian Ocean at the world-famous Cottesloe beach. Fremantle's historic colonial streets pulsate with the energy of street-performers and buskers, couples walk hand-in-hand through its colourful and lively markets. The lively street cafes and restaurants along its famous 'cappuccino strip' are perfect resting places to indulge in a spot of people watching. Your friendly driver will pick you up in the comfortable air-conditioned luxury coach before sharing experiences, fascinating facts and enchanting stories in the on-board full commentary throughout the morning. This comprehensive tour includes Perth City, Fremantle, Kings Park Botanical Gardens, Indian Ocean beaches, swanky suburbs and the Swan River. Today you will see Perth City, the famous WACA (Western Australia cricket ground), impressive Swan Bell Tower, Perth Town Hall, St Georges Terrace (hub of Australia's minerals and energy industries), Barrack Street Jetty, Perth Mint (working gold mint, stunning sandstone colonial architecture), Old Swan Brewery and Royal Perth Yacht Club (once home to the America's Cup). Stop at magnificent Kings Park for spectacular views over Perth skyline, Swan River and Melville Water. Walk through the tree canopies on the Tree Top Walk see the 750-year-old Boab tree. See famous Cottesloe Beach and the Indian Ocean sunset coastline. Tour Fremantle (historic large working port docks, rich convict history, glorious alfresco outdoor dining, marinas, charming heritage sandstone buildings, modern ocean racing yachts, colonial terraced houses, museums and galleries). Enjoy some free time in Fremantle to explore the colourful streets for yourself, perhaps enjoy a coffee on South Terrace's Cappuccino Strip or indulge in some shopping in the many unique shops or find a bargain at the weekend markets. On our way back to Perth City we see some of Australia's most expensive real-estate at the upmarket Swan River suburbs of Peppermint Grove and Dalkeith. Time this afternoon to explore more of Perth on your own. Breakfast, Luxury Day Tour with Hotel Pick-Up, Overnight Accommodation. Margaret River combines one of the world's premier wine and food regions with one of the world's best surfing locations. It's Western Australia's popular and high profile holiday playground. Many visual treats are on offer here including the dramatic coastline, calm sandy bays, massive caves, seasonal wildflowers and Busselton Jetty, the Southern Hemisphere's longest jetty. The beautiful Margaret River Wine Region is a taste of paradise for food and wine lovers. Sample world-class wines such as sensational Shiraz, exquisite chardonnay and scintillating Sauvignon Blanc which are produced here in its many picturesque boutique wineries. Culinary gems include irresistible hand-made chocolates and mouth-watering cheeses. Each year Margaret River hosts the world surfing championships. Today we travel south from Perth deep into the South West of Australia. You will experience the Busselton and Margaret River areas, have a guided tour of Mammoth Cave, see massive Karri trees, explore Cape Leeuwin Lighthouse, enjoy a Special Brewery Lunch with craft beer tastings and visit a respected winery for some wine tastings and to learn about local winemaking. Tour through the southern suburbs of Perth, through the Peel Region and onto Busselton. Stop to see the longest wooden jetty in the Southern Hemisphere (doubles as an artificial reef, stretching 1.8km across the peaceful waters of Geographe Bay). Tour through the Margaret River Wine Region and onto a premium local microbrewery for your indulgent Special Lunch in magnificent surrounds. Enjoy the flavoursome Special Lunch created from fresh local produce accompanied with beer tastings from this craft brewery. Take a guided tour through the Gothic like Mammoth Cave with vast chambers full of amazing formations (revealing fascinating facts about the flora and fauna of this region). Be awestruck at the size of the massive Karri trees at stunning Boranup Forest (over 100 years old, stretching for kilometres, pale barked Karri trees up to 60 metres tall). Visit Cape Leeuwin Lighthouse (meeting point of the mighty Southern Ocean and the massive Indian Ocean, most south westerly tip of Australia, 39 metres high). Visit one of the many respected wineries to taste some of the very best wines and to gain an insight into the local winemaking industry. Stop at the quaint and bohemian Margaret River Township (unique specialty shops featuring craftwork created by locals, chic cafes). Head back to Perth with a deep appreciation of this world-class wine region and understand why it's such a popular destination. Breakfast, Luxury Day Tour with Hotel Pick-Up, Special Lunch, Entry Fees, Busselton Jetty, Wine and Beer Tasting, Guided Cave Tour, Overnight Accommodation. The stunning Swan River meanders its way through the beautiful city of Perth, this scenic and vibrant waterway is the city's beating heart. Perth's residents make the most of this wonderful waterway, families picnic on its banks, joggers and cyclists follow its course and boats bob gently on its shimmering waters under endless blue skies. The Swan River is the perfect spot from which to view the wonderful cityscape of Perth, its northern waters lead to the stunning Swan Valley, Western Australia's world-renowned wine producing region and westward the river leads to the historic and charming city of Fremantle and the azure Indian Ocean. Today experience a scenic cruise to Fremantle and the Indian Ocean whilst enjoying your Special Buffet Lunch. See the city skyline, Kings Park, millionaire's row, giant sand spit and the bustling historic port of Fremantle. Choose from a selection of wines or beer to accompany your delicious Special Lunch and enjoy morning tea. You are transferred to beautiful Barrack Street Jetty in the heart of the city, see the building work of the massive new riverfront Elizabeth Quay, named in honour of the Queen's Diamond Jubilee. Set sail on your large stable vessel for today's river cruise. Enjoy spectacular views as you cruise the calm waters between Perth and Fremantle. Your Captain will point out the many sights, including Perth's impressive Bell Tower, Kings Park, the restored old Swan Brewery, Royal Perth Yacht Club, many magnificent homes overlooking the river and Fremantle's busy inner harbour. You will learn about Perth's rich history (and about some of its more notorious individuals). Tea and coffee is served in the morning. Your delicious Special Buffet Lunch is taken onboard looking out over million dollar river views. It includes hot dishes, continental meats, fresh local prawns and mixed variety of gourmet salads all followed by cake and dessert. You have a choice of wines, beer or soft drinks. This afternoon you can wander through the streets, shops, galleries and museums of Perth or simply relax at your hotel. Breakfast, Swan River Cruise, Special Buffet Lunch, Local Wines and Local Beers, Live Entertainment, Overnight Accommodation. Enjoy a full day exploring the magnificent wildflowers of Perth and the surrounding regional areas on your specialised wildflower tour. You will travel to the best areas surrounding Perth to experience the remarkable wildflower phenomenon, visiting places such as the Darling Escarpment, Wireless Park, Gingin and Toodyay. The itinerary varies and is designed to help ensure you visit the areas with the most prolific wildflowers on the day. Profusion varies daily and is dependent on Mother Nature. Your experienced botanical guide will identify rare flowers and show you popular favourites such as everlastings, orchids, red and green kangaroo paw, Banksia, bottle brush and of course Western Australia’s famous orange flowering Christmas trees. Stop for lunch close to the wildflowers and enjoy ample time to identify and photograph the flowers. Be guided through Kings Park Botanic Garden. Perched high on the Mt Eliza scarp in the heart of Kings Park, this world famous botanic facility is a sweeping 17 hectares of stunning garden displays, featuring 3,000 striking species from around the state. Plantings are grouped by regions of the state or notable taxonomic groups, and some are purely for spectacular display. Use your complimentary wildflower booklet to help you identify and the many various varieties of flowers during this exciting day. 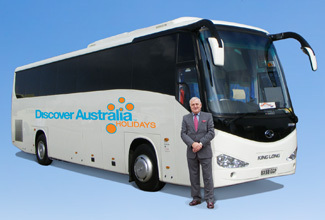 Luxury Coach Tour with Hotel Pick, Lunch, Complimentary Wildflower Guide, Overnight Perth Accommodation. Time to say goodbye to beautiful Perth, your fellow travellers and friendly hotel hosts. You will be personally met at your hotel by a DISCOVER AUSTRALIA representative and transferred from your hotel to the airport for your flight home. Breakfast, Meet and Greet Personalised Departure Transfer. This package includes all flights as detailed below in the price section (including all fees, levies and taxes). However, we can tailor this package to include our special discounted 'package only' airfares from anywhere. Simply let us know. You have 3 choices of accommodation in Perth. Our "Good Standard" central Perth hotel has great facilities, a comfortable room and friendly service (typically 3.5 stars). Alternatively, why not treat yourself? The "Deluxe" hotel has superior facilities, stylish room and first class service (typically 4 stars). The “Luxury” hotel is upscale with a more luxurious feel for the discerning traveller and great for celebrating an anniversary (typically 5 stars). The package is priced on the "Good Standard" option. See Optional Upgrades below for more details, or simply ask. You will be personally met by a DISCOVER AUSTRALIA representative and transferred from the airport to your hotel and from your hotel to the airport for your flight home. You’ll receive the FREE DISCOVER AUSTRALIA Bonus Voucher Book that includes $500 value of discounts and bonuses throughout Perth and WA at shops, restaurants attractions, wineries etc. 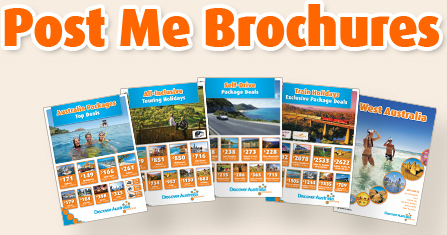 It’s a great way to save even more on your Western Australia holiday. The Perth All-Inclusive with Wildflower Discovery is very popular. Many dates book out well in advance, please book soon. Please complete as much as you can to help your Specialist Consultant provide the best response. Dates You're Unable to Travel? How did you first hear of DISCOVER AUSTRALIA? Your Specialist Consultant will respond soon. The Australian Specialist. Enjoy more, for less. & a great price too! See Important Information for conditions before booking. Hover over the "Special Bonuses" for details and validity. © Copyright Discover Australia Holidays 2016. All rights reserved.